The Buffalo area is home to numerous bus operators. Tour buses, charter buses, party buses, and city buses all operate in the city, and thousands rely on these operators for safe transportation. In general, there are three ways you can be involved in a bus accident: as a passenger, driver, or pedestrian. Our Buffalo bus accident lawyer discusses the most common bus accident cases. Bus operators must properly maintain their vehicles and ensure the safety of their guests. If a bus operator caused an accident that you were injured in, you may be entitled to compensation. Common causes include: Reckless or impaired driving, unsafe bus/equipment conditions, and operator error. Being involved in an accident with a bus is traumatic and potentially life-threatening. 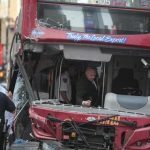 Other motorists often suffer significant injuries and property damage after colliding with a bus. Contact a personal injury lawyer right away if you or a loved one has been hurt in a bus accident. Pedestrians and cyclists are often involved in bus accidents, and these accidents have life-altering consequences for victims. If a bus operator’s negligence caused your accident, you may be entitled to compensation. Make sure you seek medical attention right away, as not doing so could hurt your claim. After you have received proper treatment, document injuries and evidence by taking photos or collecting witness accounts. If you have been injured in any of these common bus accidents, please contact our experienced Buffalo bus accident lawyers today to schedule a free consultation. We will make sure you receive the compensation you deserve.